Seek To Know The Truth: In Defense of the Faith - Where Does Prophecy Fit In—And Why? 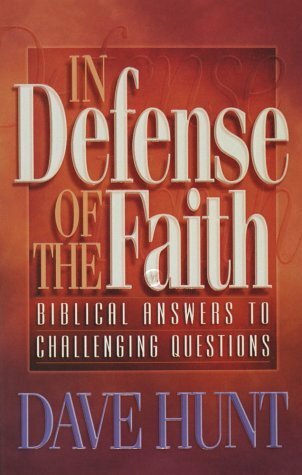 In Defense of the Faith - Where Does Prophecy Fit In—And Why? Where Does Prophecy Fit In—And Why? Question: I have heard it said that the prophecies in the Bible are worded in such a way that their alleged “fulfillment” could fit almost anything. Is this true? And if not, what is the purpose of prophecy? It seems to me that for the Bible even to be involved in prophecy puts it in the realm of speculation and detracts from its credibility and reliability and its excellent teaching on morals. Response: The Bible is about 30 percent prophecy, and for this .reason alone it is absolutely unique. There .are no prophecies in the Qur’an, in the Hindu Vedas or the Bhagavad-Gita, in the sayings of Buddha and Confucius, in the Book of Mormon, or anywhere except in the Bible. Nor are there any prophecies concerning the coming of Buddha, Krishna, Muhammad, Zoroaster, Confucius, or the founder or leader of any other of the world’s religions. The Jewish Messiah is absolutely unique in this respect. His coming was foretold in dozens of specific prophecies that were fulfilled in minutest detail in the life, death, and resurrection of Jesus Christ. There are a number of reasons for biblical prophecy: to prove God’s existence by telling us what will happen in advance; to identify the Messiah by specifying numerous details concerning His coming, including even when and where; and to warn the faithful of conditions and dangers in the last days. (We deal with these elements of prophecy in other books.) As for being “worded in such a way that its alleged ‘fulfillment’ could fit almost anything,” that simply is not true, as any examination of biblical prophecy proves. Inasmuch as fulfilled prophecy proves conclusively both the existence of God and that the Bible is His Word, the Bible’s prophecies have been critically examined in many strenuous attempts to disprove them. For example, so many factual details are given in the book of Daniel concerning the Medo-Persian, Grecian, and Roman empires that the skeptics tried hard to prove that these prophecies had actually been written after the events had occurred. Otherwise, they would have to admit that the Bible had indeed foretold the future. The date of Daniel was therefore attacked from every imaginable angle over the past two centuries. Every assault failed, however, and the book of Daniel stands impregnable today. It was, of course, a complete waste of time to attempt to prove that Daniel had been written after the rise and fall of the four world empires of which it foretold. Even the most critical skeptics had to admit that this book had been part of the canon of the Old Testament at least before the coming of Christ and that events subsequent to Christ’s birth were presented accurately. The book of Daniel, for example (as we shall see later), foretold the very day (April 6, 32 AD) that Jesus would ride into Jerusalem on a donkey (as Zechariah:9:9 had prophesied) and be hailed as the Messiah—the day that is now celebrated as Palm Sunday. Daniel foretold the splitting of the Roman Empire into two parts (East and West) centuries before it occurred. Politically and militarily, that split between East and West came in AD 330, when Constantine moved his capital to Constantinople. Religiously it came in AD 1054, when Pope Leo IX excommunicated Michael Cerularius, Patriarch of Constantinople. The prophecies about the Jews—as about the coming Messiah…[are] specific (in contrast with the Delphic and other Pagan oracles who…hedge[d] against mistake[s])…[and are] so numerous as to make accidental fulfillment almost infinitely improbable…[and] of such nature that the events predicted seemed beforehand mutually destructive and were and are unparalleled in human history…. ‹ Question: My daughter, who is a committed Christian, is a high school junior who would like to attend a Christian university and major in counseling....Could you recommend a good school for her?